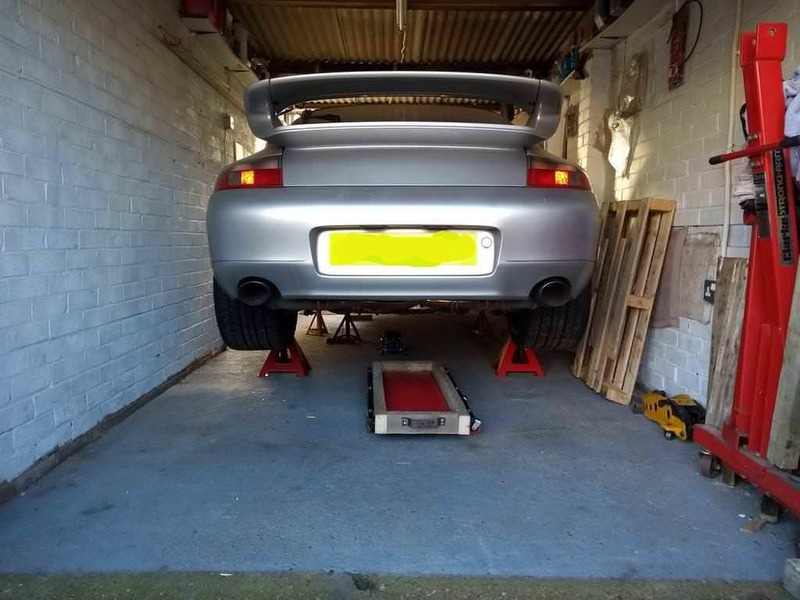 I was on axle stands and didn't quite have enough room so actually lifted the back of the chassis up with my engine hoist wrapped around the rear impact bar. 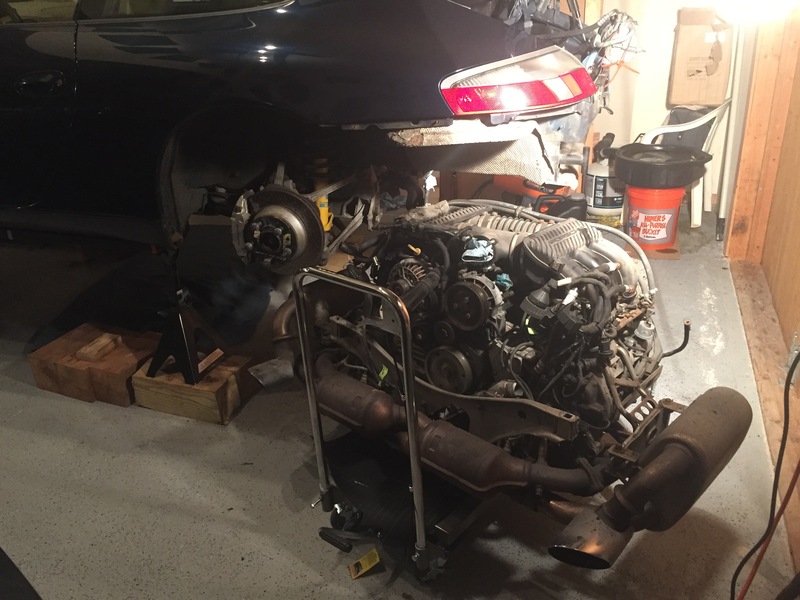 Lifted a few inches off of the rear axle stands and pulled the engine out. 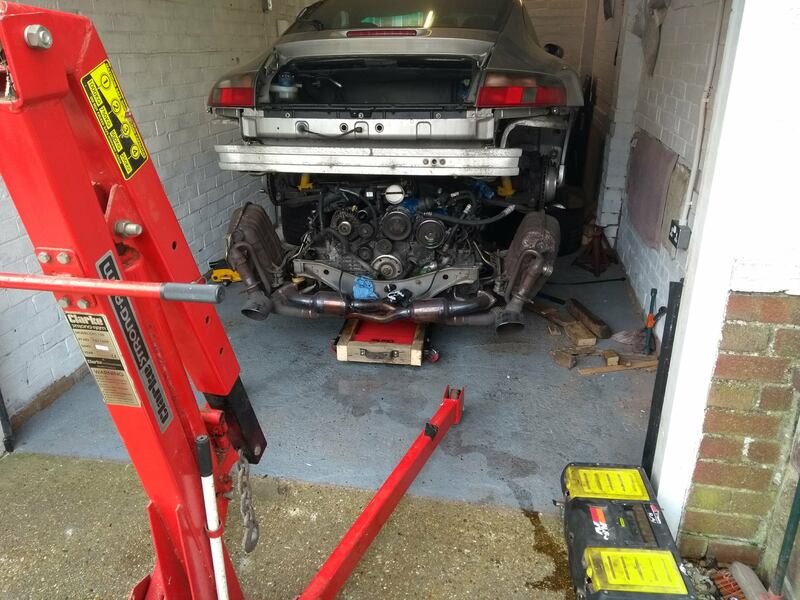 I realise this isnt exactly a scientific way of doing things but it worked and was my first attempt at removing a Porsche engine as I'm used to engines coming out through the top. 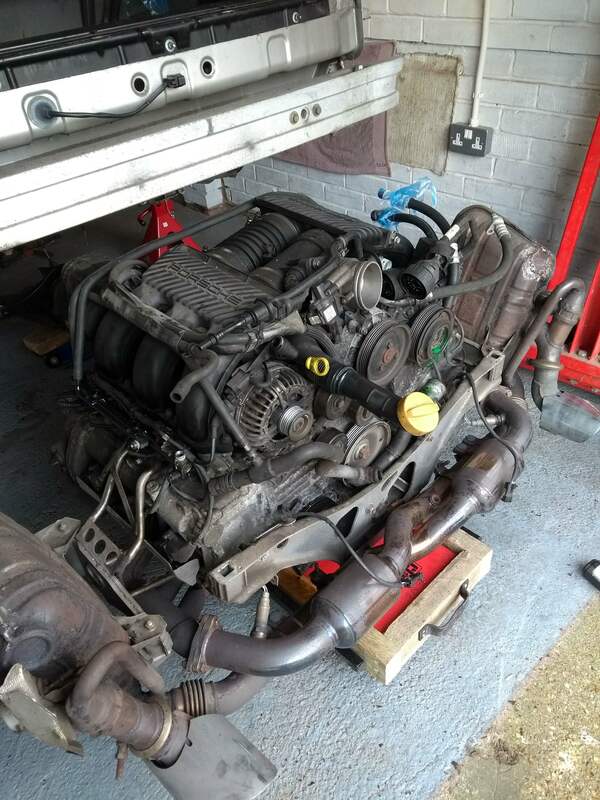 Need to take a Boxster engine out now and have decided to buy a lift instead as I cant be bothered to scramble around on the floor anymore. I see you are fairly local to me (am Leighton Buzzard) - I have just got a lift fitted. You are welcome to have a look. Car now up on axle stands. The stands at the front are standard 2 ton ones bought a while ago from Halfords. They reach 42 cm tall at max extension. The rears are "Wolf 6 ton ratchet" items bought from ebay for £33 for the pair inc delivery. They can go up to 24" or 59cm. I have lifted the rear of the car (measured from inside the pu rear bumper onto the bottom of the rear impact bar) from 38cm to 79cm i.e. 41 cm. 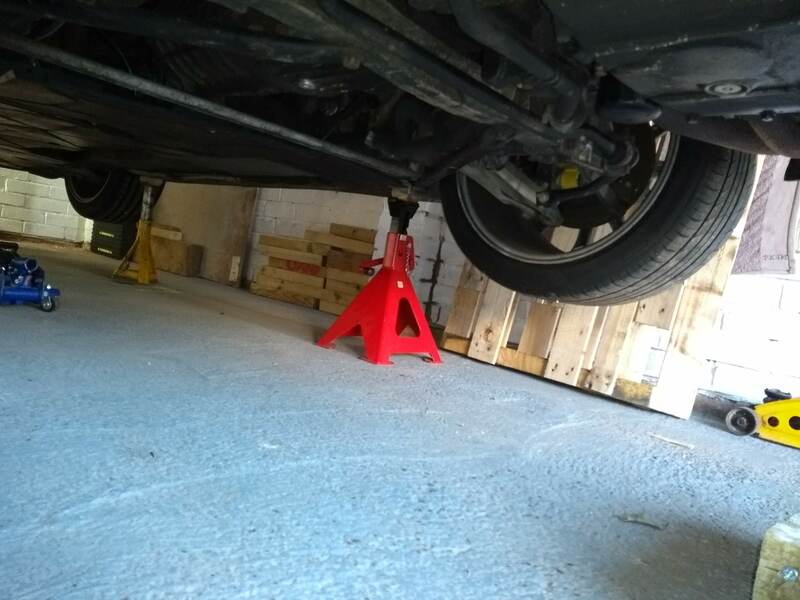 The rear axle stands are set at about 50cm high to achieve this. Trolley that I'm going to use to put engine on is in the foreground. Its a crawler with a substantial wooden frame built to support and spread the load on the sump and gearbox. I had to lift the car in stages. 2.) 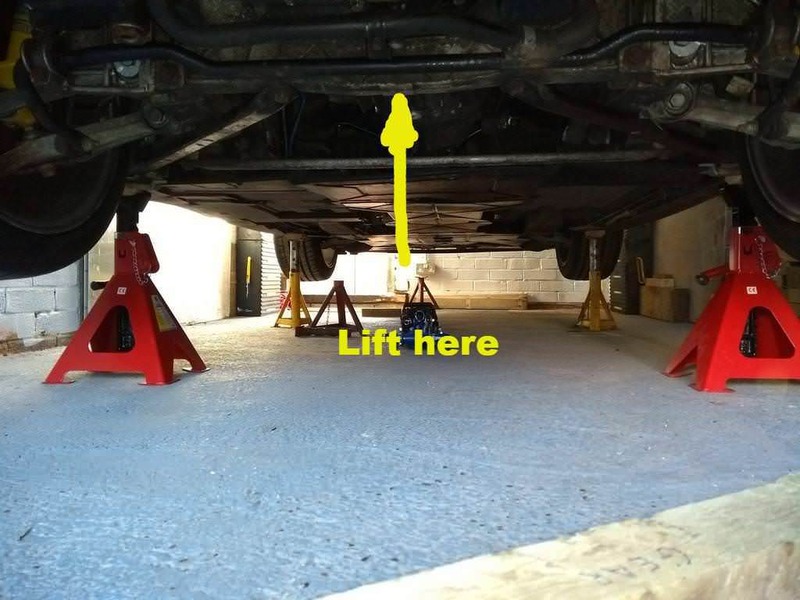 Lift front and place on front axle stands. 3.) Lift rear again and fully extend the small axle stands. 4.) Lift front on the chassis (Well protected with wooden block) and fully extend front axle stands. I have a cheap 2 ton trolley jack. One with a rubber pad, and larger lifting range would be a lot easier.. 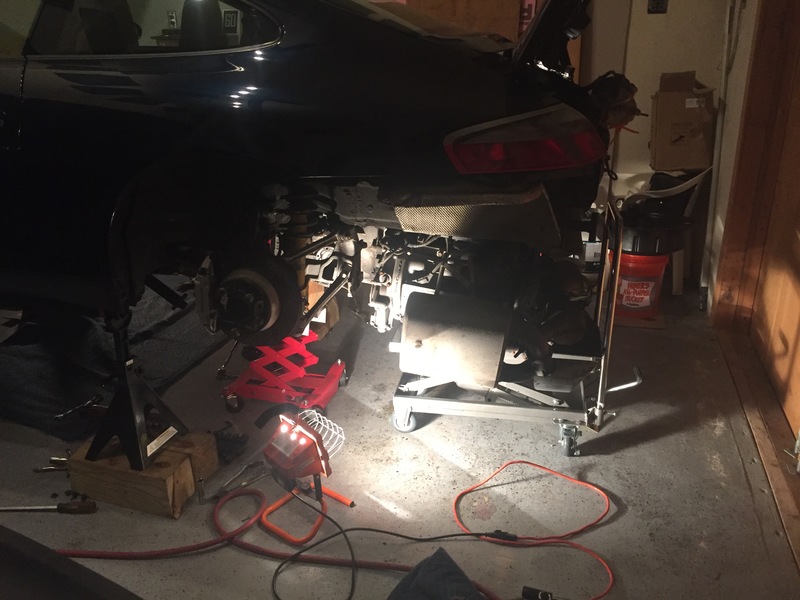 I'm planning to drop the engine in my Cayman soon (ish - I don't like the cold). Cheers Dporto. Good information there. I only have 530mm gap under the sump and my trolley is 130mm tall. I suspect I will have to go up another 25mm to be sure of clearing the rear impact bar. Seems like a few of us need engines out! Damn!! I look at these threads and shake my head with amazement and awe. Well played to those of you who are capable. Changing out my exhaust is as much as I’m willing to risk. I use a piece of rubber cut from the tread of a scrap tyre, it sits on the metal cup and makes a great protector for whatever I am lifting. I spent a while looking round, before I bought my scissor lift. I would very careful removing an engine from a car, while its on the tilting lift, as the CG would shift entirely. Not sure how the tilt-lift would respond. Thanks to comments and pictures from forum members, I raised rear of the car on the stands to a mighty 82CM from the floor. 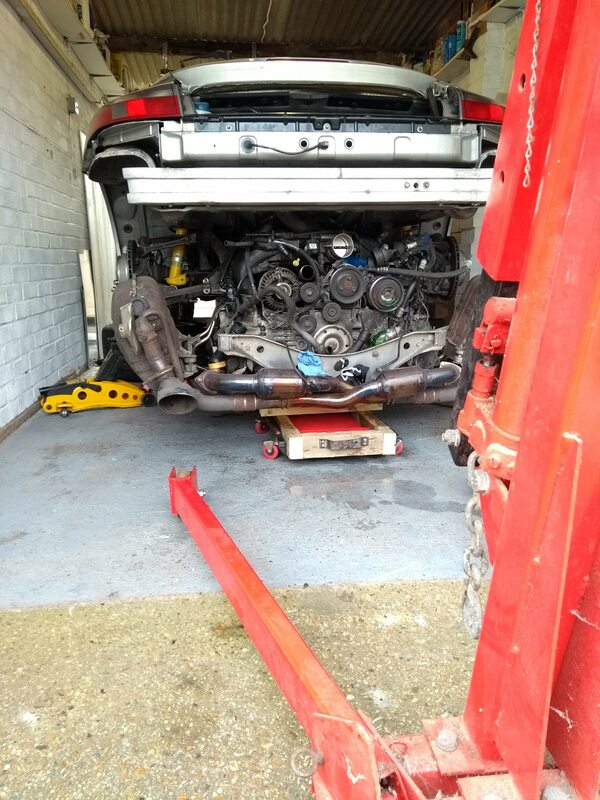 popped over, and very kindly assisted, (or rather I assisted him) extract the engine from the car. You will note the use of an engine crane as opposed to the ATV jack / trolley that I was originally planning to use. This is Infrasilver's method, and I think ideal. The main benefit is that it has a much greater range of movement than the hydraulic ATV trolley / jack, and it also finds its own balance point, so your not in danger of the weight of the engine toppling a jack. Though follow Infrasilver's method of securing the left (passenger) side, as it otherwise it sits lower than the right side when lowering the engine down. It was a pleasure to meet you James and for me an enjoyable afternoon . 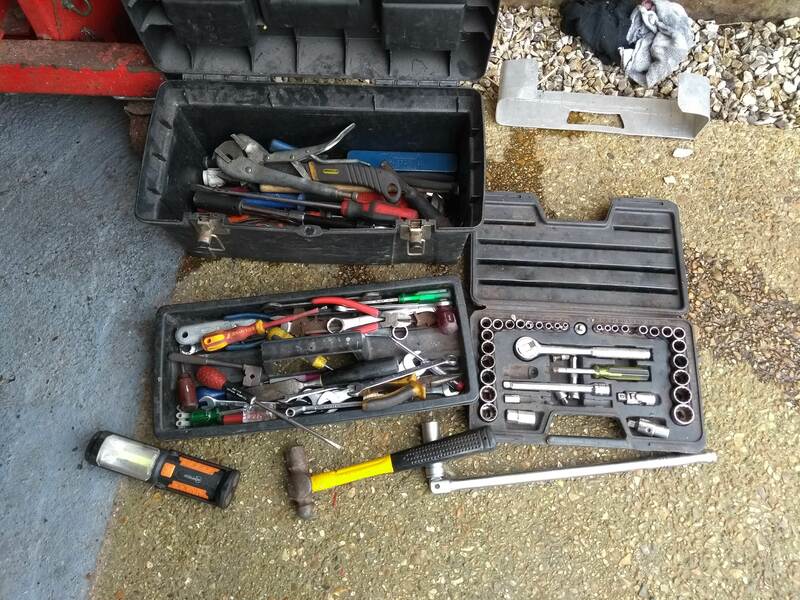 Tool kit was .. interesting shall we say but just goes to show people that only a few tools are required to drop an engine .. good Porsche design i would have to say . Ill bring a Torque wrench and a few tools come reinstalling time though lol . One thing i did think of after i left .. remove the crank angle sensor .. best if done while the box is out just in case we have problems refitting .. we can refit it after we install the engine . Dam mate .. thats a hell of a hill you live on .. the bike slid out when i got on it !!!! Cheers for a fun day .. tommorow its boreing .. i have to do it for a living .. sigh . Ohhh and yes .. i did use the hammer ! Whats up with the engine meaning it had to come out? Really impressed considering the tool kit time for some upgrades. I'm glad some of the tips helped, it took me a few engine drops to find the best and safest way. Cheers guys. Socket set is now nearly 30 years old. Think I've got my moneys worth from it! Wasz - I'm planning a separate post to discuss, but potentially nothing. However, there have been a couple of things that have bothered me which made me question whether I plan to keep the car. There simply isn't anything else I want (that I can afford). As Demort said earlier today, and I agree. If I sell this one and get another, I'll just eventually end up at the same point I am now. 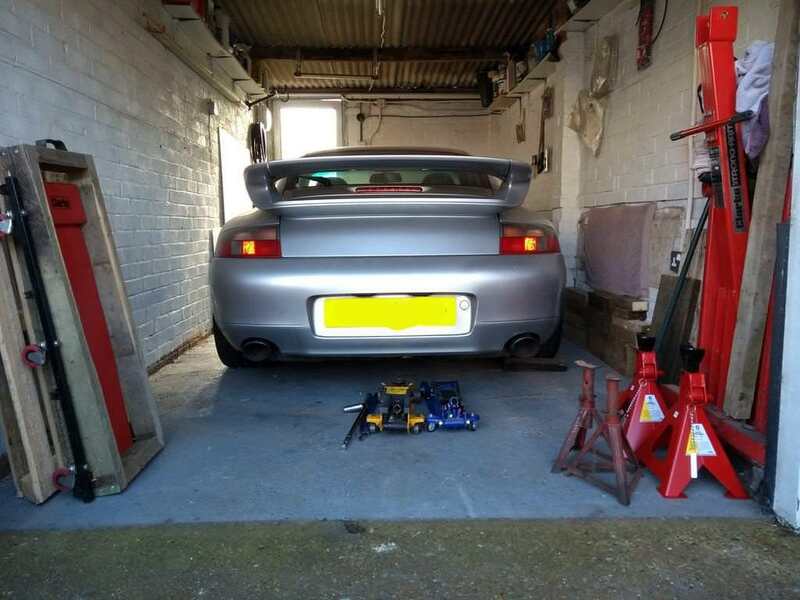 I want a car to use and enjoy rather than keep in the garage as an 'investment'. So going to send the engine to Hartech for a re-fresh, and maybe a few upgrades. Good Job! (Demort too... . RE: Tools - sometimes I wish I had less than I do (sort of). I'm always amazed when I'm done with a job, just how many tools I've used - it literally takes me an hour or so just to wipe them down and put everything back in it's place, and Ioften do this while I'm working as well (if it's something I won't be using again)... I'm somewhat of a "tool nut", but I don't buy stuff just to have it (I've been in friends garages that look like hardware/tool stores, but nothing ever moves and no "work" gets done...) - I use everything I buy, albeit some quite a bit more than others. All this being said, often times there is no good substitute for the proper tool both from a safety standpoint as well as an efficacy one.